Decorate	your Christmas tree using any color, theme and decorations,	Christmas lights encouraged! There will be a business category as	well as an individual category. Tree	height can be 4ft-8ft tall and must be artificial. Any color you	prefer. Decorations,	Christmas tree and stand need to be provided by the individual or	team and you must provide your own extension cord. Power provided	on the square. Deadline	for entry forms will be Wednesday, December 5th at 5pm. 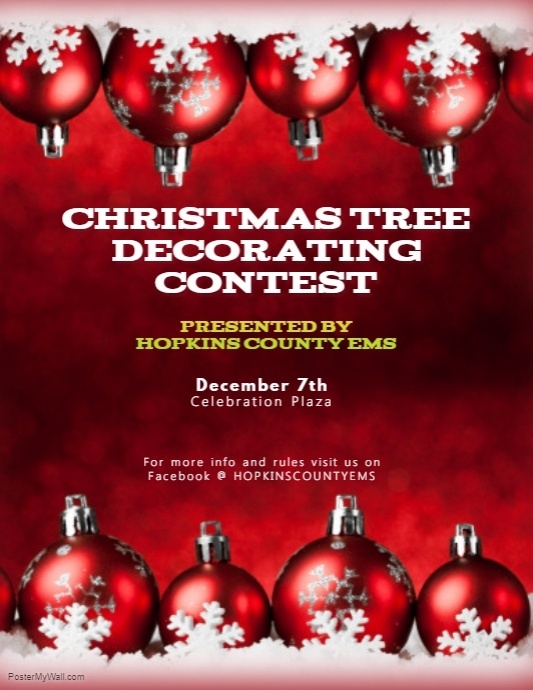 Entry forms can be picked up and turned in at the Hopkins	County EMS Central Station (beside the hospital). Entry forms can	be delivered personally if needed. Tree	can be brought to the square pre-decorated or can be decorated on	the square MONDAY, December 10Th starting at 10:00am but must be completed and ready to be judged by	4:30pm. Each tree will have a number provided to you the day of	judging. All	trees will be displayed to the public for judging. Judging opens up	at 5:00pm and ends at 8:30pm. There will be trophies for first	place, second place and third place. Tickets	will be available the night of the judging. $1.00 buys one vote and	all proceeds will be donated to the Safe-T Crisis Center to be	donated to a family in need for the holidays. All	trees need to be removed the night after the judging. Also, if you	would like your tree to be donated to a family in need within the	community let us know at the time of your entry for arrangements to	be made for delivery. Be	creative, have fun and show your Christmas spirit!